Your teeth can become worn and discolored due to injury, neglect, or simply due to the passing of years. Let us rejuvenate your smile and restore your oral health. Torrington Dental Care can provide dental crowns and other lifelike restorative solutions to patients from Litchfield County, Burlington, New Hartford, Winsted, Bantam, Goshen, and Harwinton, CT.
Why Choose Torrington Dental Care for Restorative Dentistry? 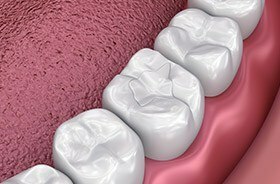 If you have one tooth or several teeth that are damaged due to wear and tear, injury, or decay, one or more porcelain crowns may be the solution that heals your smile. 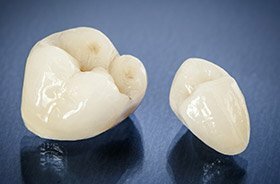 A crown from Torrington Dental Care is a custom-made tooth, milled out of porcelain, that is placed over your own natural tooth (after a little preparation). Since the crown is made especially for you, it will be indistinguishable from your other teeth and will function so naturally that it feels fantastic. 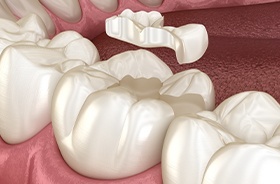 Crowns are a durable way to restore a damaged tooth or to correct problems with tooth positioning and spacing. Whether you require one or several crowns, you can rest assured that your smile will look and feel incredible. If the dental damage you’ve experienced is too significant for a filling but not quite extensive enough to require a full dental crown, a custom-made inlay or onlay could provide the ideal “in-between” solution. This type of restoration preserves more natural dental structure and is virtually indistinguishable once in place. Inlays fit within the cusps (raised bumps), while onlays are designed to cover one or more. 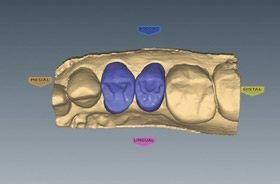 Traditionally, the creation of a new, customized dental crown would require at least two appointments of a patient’s time in addition to uncomfortable impressions, a temporary restoration, and weeks of waiting in between. With revolutionary E4D™ technology, our team has been able to transform this process for the better, greatly improving treatment speed without sacrificing quality. Now, we can rebuild decayed and damaged teeth in a single appointment! Over 90% of the population here in the United States will experience one or more cavities over the course of their lives. Instead of traditional amalgam, we have invested in a more worthwhile solution to this common ailment – tooth-colored fillings. This restorative solution is crafted from durable composite resin, precisely shaded to match your natural enamel, and carefully sculpted into place within the tooth to correct the damage in a conservative and comfortable way. If you are missing one, two, or an entire arch of teeth, you are at risk of developing a multitude of additional dental and overall health problems. Thankfully, we can give you your smile back with a set of full or partial dentures. Thanks to modern techniques, we’ll be able to ensure you get the ideal look and fit you want. It’s one of the quickest and simplest solutions to helping you smile again.